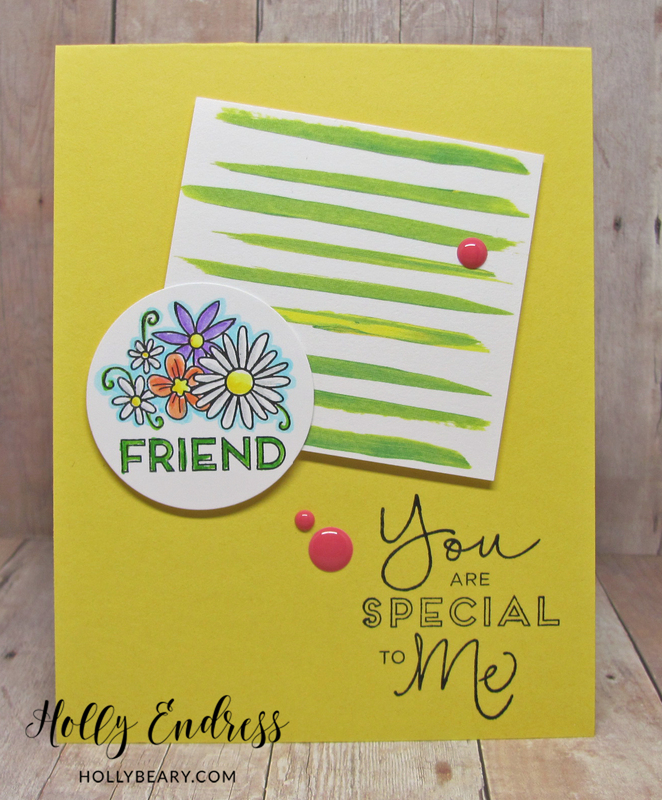 Hollybeary Creations : Create Kindness Card Kit!! Hello everyone.. I hope you are having a great start to the week. Today I have a special card kit to show you that is only available this month. So, time is running out to get yours. 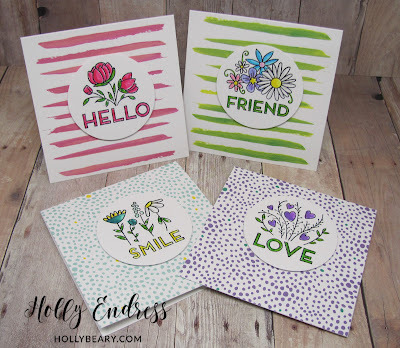 I was contacted by Lisa at Close to My Heart to check out this fun Stamping Kit called Create with Kindness. 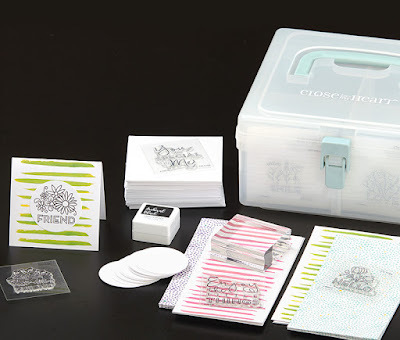 "The Create Kindness card kit (CC1145) includes 24 pre-printed card bases with envelopes, 8 exclusive M-size stamp sets, a 2″ × 2″ My Acrylix® block, and an Archival Black mini pigment ink pad, all packed snugly in the My Acrylix® Mini Stamp Organizer." This kit has everything you need to create 24 cards for Friends and Family. I created a few cards in just a few minutes and then I create a full size card using products from the kit. So you can use the Stamps again for many other projects. There are 6 each of 4 different pre-printed designed 3x3 cards and envelopes. 24 Pre cut White Circles to stamp your images on. I stamped the images onto the circles using the included mini ink pad and I colored them in with some Zig Clean Color Real Brush Markers. I added each circle to the front of the cards with some foam dots. I stamped the larger sentiments included in the kit inside each card. These would be great to have on hand for Teachers as well. I decided to take one of the mini cards and cut it into a smaller square and adhered it to a Yellow standard A2 size Card Base and then I added the Circle element in the corner and stamped the larger sentiment in the lower corner of the Card front. These stamps will have many uses after the products included in the kit have run out.. or you can purchase additional pre-printed cards and supplies for your kit as well. I really love the font in the larger sentiments. I stamped these images with just the mini ink pad that came with the kit and it was a nice clean impression and it worked well with the Zig Clean Color Markers. This kit is only available until the 30th of September. The retail price is $46.95 US. Contact your Close to My Heart Rep to purchase yours today or you can find a local rep on their website here. Lisa has offered an extra kit for me to giveaway on Instagram Today. Head over to my Instagram for all the details on how you can WIN a set of your own. And Thank You to Close to My Heart for sharing this fun kit with me. Kits are the best...it takes all the thinking out of crafting! Some days I need that! Thanks for the fabulous giveaway!